Hi! 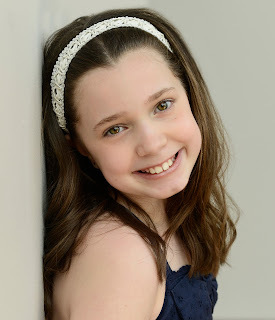 My name is Nora and I'm going into the 5th grade. 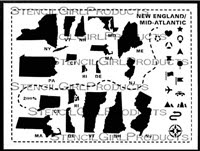 My mom is a StencilGirl Artist or more formally June Pfaff Daley. 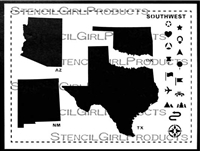 Recently, she designed these super cool state stencils. 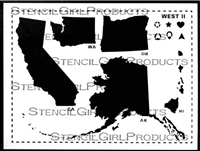 My class studies the states from 4th-8th grade so when I saw these stencils I had a great idea. 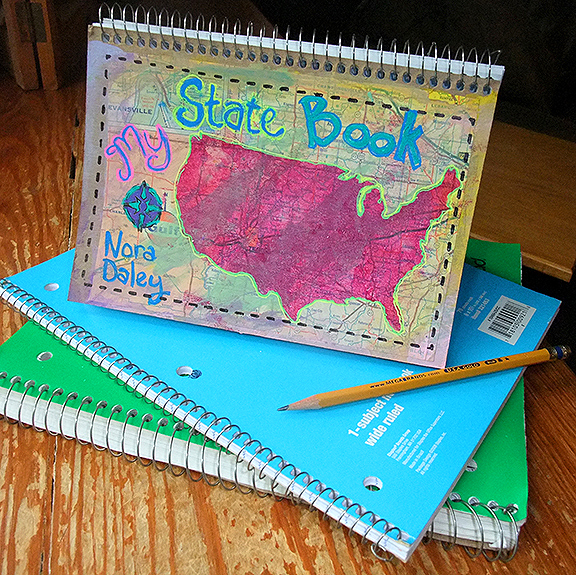 I made a handy dandy state book which is quite helpful when I need to study the states for school! This book is very easy to make. First, take a trip to your local office supply store and purchase a spiral bound 50 pack of 5" x 8" index cards. I got the kind of cards that were ruled on one side and blank on the other. 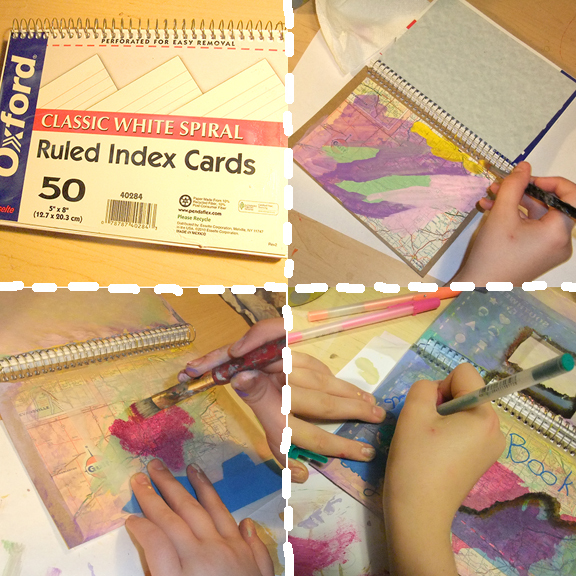 To create the cover, I used gel medium to add paper and maps to the front and back of the book. I made the actual cover the back of my book because I wanted the blank sides of the cards to be facing front. Then, I used pastel shades of acrylics to paint over. 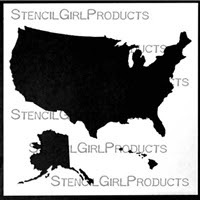 When that was dry, I stenciled the Road Trip USA stencil on the front of the book using the 6" x 6" stencil. 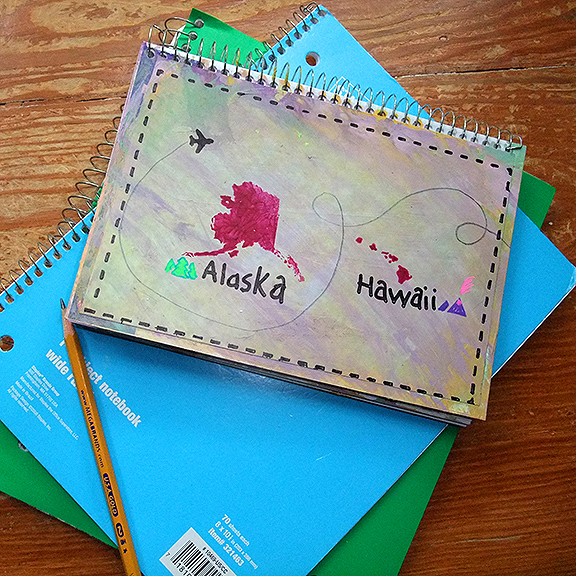 I couldn't fit Hawaii and Alaska on the front of the book so I stenciled those states on the back. I finished it up by using cool neon gelli roll pens to add my name and the book's title. 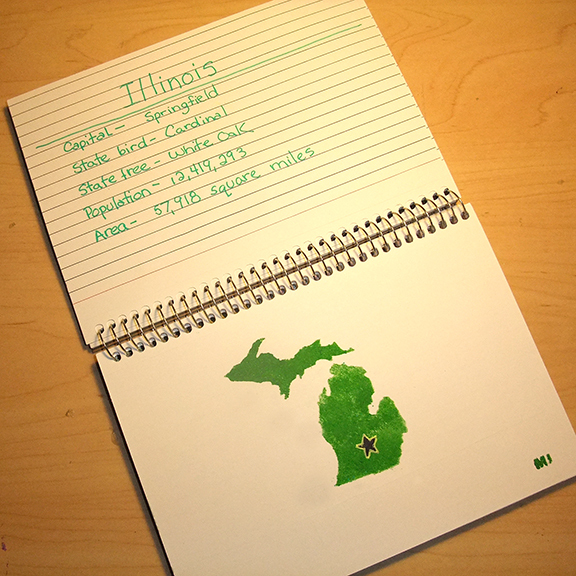 For the inside of the book, I made each card a state and since there are 50 cards for 50 states it worked out GREAT! 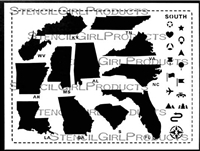 On the blank side of the card, I stenciled the state. I used the little stars to show about where the capital of the state was located. 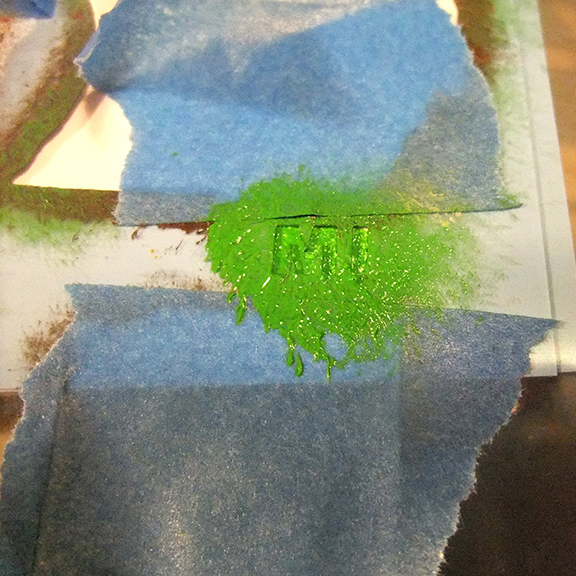 Then, I stenciled the little state abbreviations in the corner. My mom showed me how to use painters tape on the stencil so I only got paint where I actually wanted to stencil! Next, I wrote information about the state on the back. I included the capital, state bird, state tree, population and area. If I need to know more about the states for school, I have room to add it later. Boom! 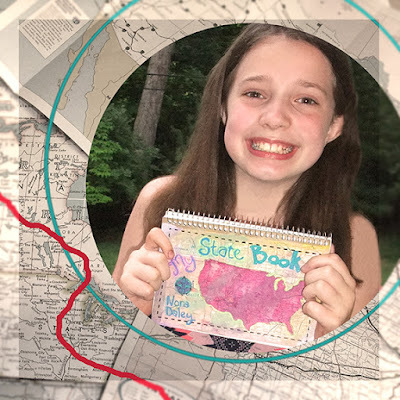 My very own state book! Here is a look at the front of my finished state book . . .
Nora Daley is a 10-year-old visual and performing artist who knows her states! She especially loves dancing, singing and acting. 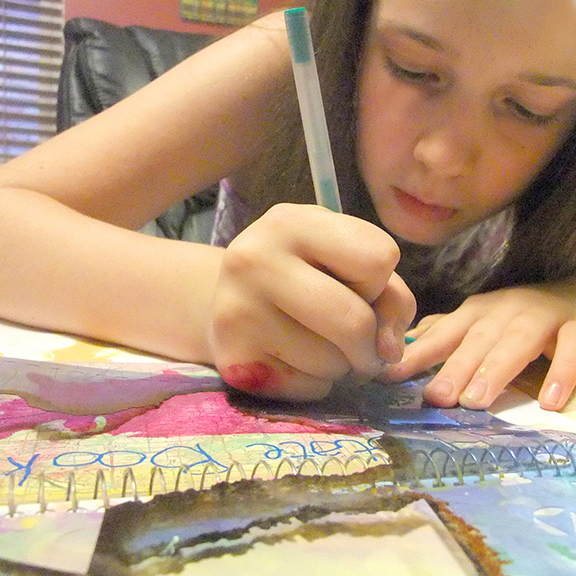 One of her other favorite things to do is to make a huge, happy mess in her Mom's art studio. She is adorable- and smart! 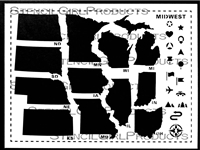 What a great way to know the states! She is precious - like mother like daughter! Such a creative idea and great for a fun, summer project! Such a great project! You did a wonderful job. This is such a cute idea! 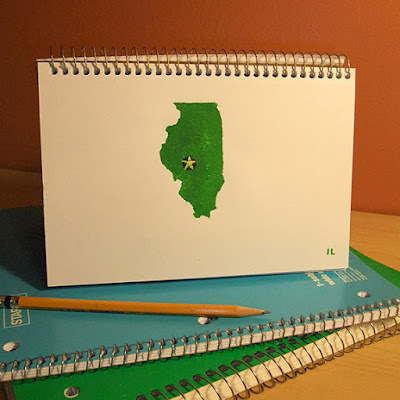 I wish I'd had something like this when I was learning the states... it turned out beautiful! Very clever, Nora! I like the way you used the book of index cards! If one's local office supply store doesn't have the books, though, you can still use the 5 x 8 cards, and being careful to allow for it when you do the stenciling, have the office supply copy center coil bind it for you!